RIT’s third annual DataFest hackathon, sponsored by the American Statistical Association, takes place March 29-31 in the Xerox Auditorium in James Gleason Hall. Associate professor Ernest Fokoué, center, expects more than 200 students to participate this year. 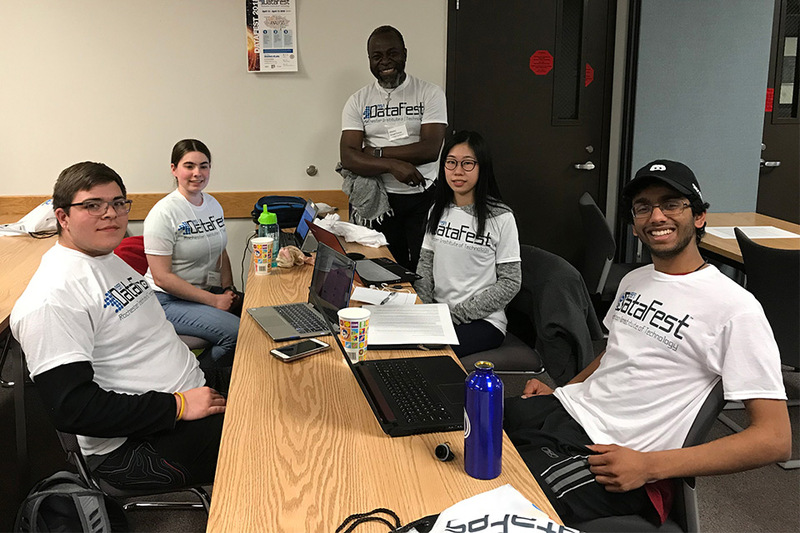 College students from across the Rochester area will face off in a data analysis competition during Rochester Institute of Technology’s third annual DataFest hackathon. The event, sponsored by the American Statistical Association, takes place March 29-31 in the Xerox Auditorium in James Gleason Hall. For more details, go to www.rit.edu/science/datafest or contact Ernest Fokoué at epfeqa@rit.edu.